Yes.......this really is exactly how they arrived. 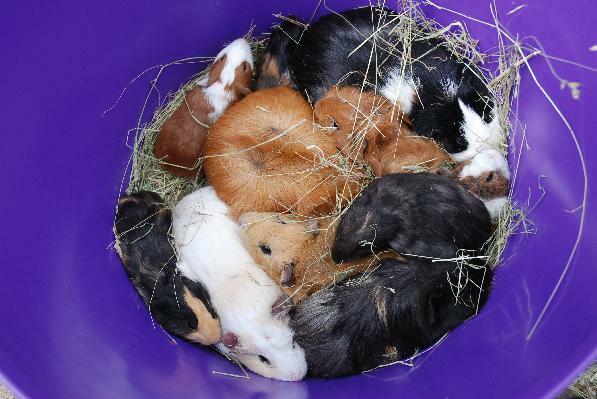 Not a KFC 12 piece bargain bucket, but a bucket full of 12 live guinea pigs. It's actually not funny. We were absolutely gobsmacked. Our hearts always sink when we find boxes or carriers on the doorstep, but to find a bucket with guinea pigs standing on top of each other takes the biscuit really. There was no advance phone call, no knock at the door, no e-mail, no note. Absolutely nothing. Irresponsible? Definitely. A dog, cat, squirrel or fox could have inflicted catastrophic injuries. Thank goodness we found them quickly - they really wouldn't have lasted long if we hadn't. The poor little mites must have been terrified. At least they are safe now, but where are the Dads? There were only Mums and babies in the bucket.